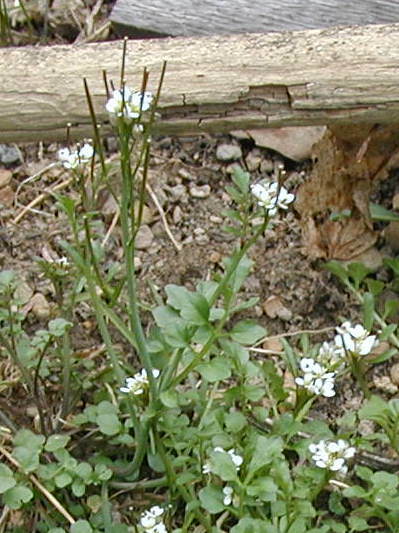 How do you know that it’s Pennsylvania bittercress? The characteristics that identify it include the shape and arrangement of both leaves and flowers, as well as the very early blooming time. The Peterson Field Guide to Wildflowers states that it will bloom from April to June and that it can be found “nearly throughout” the Northeastern and North-Central United States. Blooming time alone can’t identify a flowering plant, but it can help eliminate other possibilities from a tentative list. Some plants like dandelion will bloom periodically through out the year, so the time of blooming is not always helpful in identifying a plant. Other flowers will bloom in defined periods which does help in plant identification. For example, skunk cabbage blooms in late winter, sunflowers bloom in the summer, and goldenrods bloom in autumn. 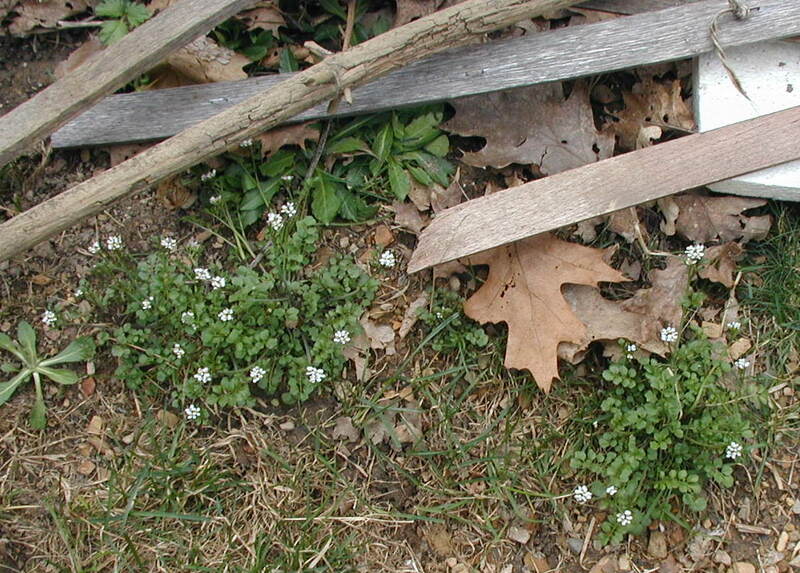 The early Spring blooming of PA Bittercress heralds in the warmer weather. Still, there’s cold weather and possibly snow to fall yet at this time of year, but the little flowers of this member of the mustard family produces seed so fast that it will surely come back next year – even if the mother plant were to be frozen out by extreme March weather. Take a look at the seeds already produced, near the flower clusters. The seed pods are thin and erect, surrounding the flowers at the tops of the stems. When the seeds have matured, brushing past the plant will forcefully eject the seeds from their pods. Pulling up the plant will also disperse the seeds, so there’s no use trying to make the lawn free of this prolific weed. The rounded basal leaflets are in pairs with the terminal leaflet being slightly longer. Leaflets are narrower and less round on the compound leaves found higher up on the plant. 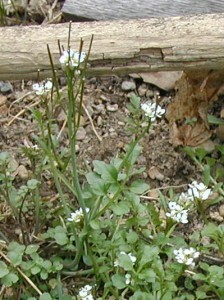 This Cardamine species, Pennsylvania bittercress, is found in moist areas, near springs or roadside ditches, and in lawns. 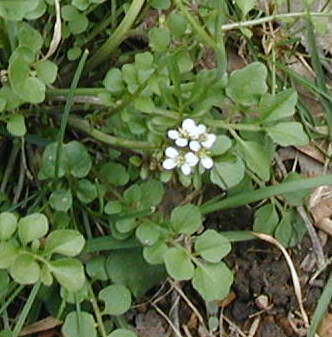 Thanks for a good description and photo–compound leaf was not chickweed, now I know it is Pennsylvania Bittercress found in northern Virginia. That’s right, Karin! Thanks for letting us know where you found the PA bittercress. I’m afraid you can’t get rid of the bittercress, no matter how hard you try – so just enjoy it. It blooms so early in the year that it sort of sneaks its seeds onto the land when no one is looking! The seeds from previous years probably last a few years, so once they’re in the seed bank you’ll have bittercress coming back for sure. Knowing all that, it kind of makes spraying useless, so don’t even try those nasty herbicide chemicals. What I have done is pull individual plants that pop up in flower beds or the vegetable garden. I try to get them out of there as early in the year as possible, but these little plants have sneaky habits, don’t they? You don’t really see them until they bloom and by then it’s too late for the seeds are being made. Good luck though! I was wondering what that plant that was popping up all over my lawn was (I live in northeast PA). Thanks for the info. It doesn’t look good in a lawn context, but I don’t like sterile monocultural lawns – so no big deal. They taste better than dandelions, but the leafy portion is pretty small. Wow! You’re adventurous nibbling on the bittercress. Good on ya’! I guess you would have to pick a lot of those small leaves to make a salad. I don’t care for the PA bittercress popping up all over the place either, but I figured that I’d never be able to stop it. I pull the ones at the edge of the vegetable garden, but the lawn weeds get to stay. We don’t like the “fake” mono-lawns either. There’s nothing natural about them and they require too much time, money and chemicals to keep looking that way. The bittercress probably won’t last much longer, except to spread their gazillions of seeds. Try pulling one of these plants now and you can hear their seeds being flung every which way. I try to pull the plants that are close to the garden very early to avoid spreading so many seeds so close to where we want to grow veggies. 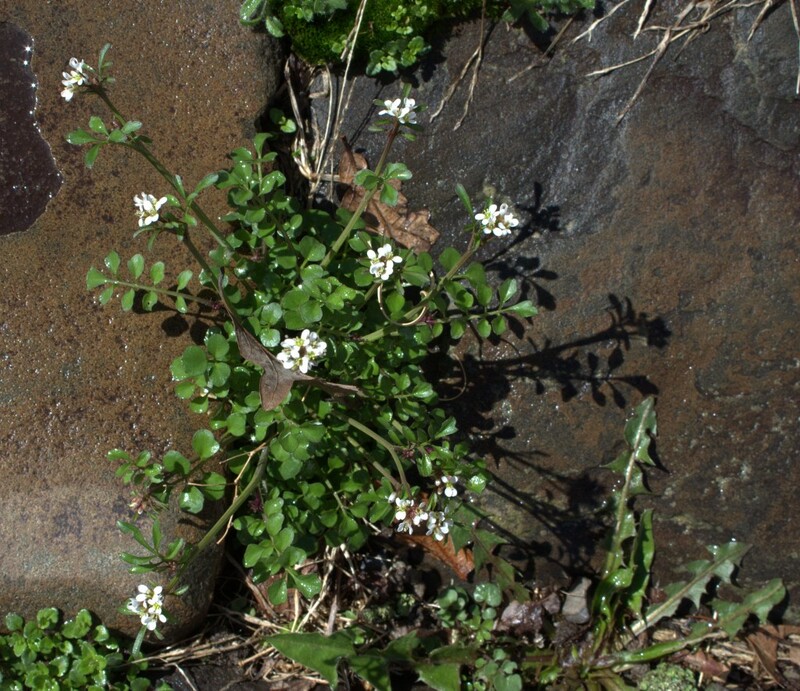 I have the PA Bittercress in Indiana. I have many perennial beds FULL OF THIS WEED AND SEEDING NOW. Has anyone ever used PREEN and when did you use it ( since this stuff is green and growing when it is cold) PREEN needs warmth to activate it? I am sick at heart because my beautiful gardens are beyond my ability to pull this weed. Thanks for your help. Preen for sure won’t kill the plants that are already there, so go ahead and pull them out. Problem solved until next year! Then try to get out a little earlier next year to get them before they shed more seeds. Since we know some are gonna grow despite our best efforts, please re-think about using a chemical that can contaminate the environment. Did you know that PREEN is highly toxic to aquatic life? It’s a nasty chemical that you don’t want to get on your skin or clothing. If just a little bit of Preen makes its way into storm runoff and gets into a stream, it can kill baby fish by killing off their food supply. Take heart, Pat. I’ll bet lots of folks that view your pretty posies aren’t too upset about the bittercress. I’m sure your perennials are the stars of the show! Hey @Pat, there is something you can use. I use it ONLY as a LAST resort, but with poison ivy and small children not mixing, i’ve been forced to. It’s made by Round Up call Poison Ivy and Tough Brush killer. Top is yellow, as is label. It’s pretty expensive, but warning is valid, DO NOT spray on or near ANYTHING you DO NOT WANT DEAD!!!!!!!!!!!!!! AND I STRESS THIS HEAVILY! I use it on my plots a good two months or so BEFORE i plant any of my flowers/food. You have to give it a good minimum of 30 days before seed would take on the spot. Thanks for the tip, Kate. Those nasty chemicals are QUITE nasty, aren’t they? That’s why I avoid them at all costs. Who can trust the dog or the kids won’t get into it and then track it inside your house? Are you serious in saying that you would spray a RoundUp product in an area where you grow food?! Do you really trust that the big chemical company who makes this toxin actually knows all the long-term ramifications of using it near and around your living spaces? With food?!! It’s just not necessary and seeing that it’s expensive, why use it at all? Having a weed-free flower bed only happens in air-brushed photos in glossy magazines, not real life. If you have weeds popping up in strange places, spray them with a vinegar solution and they’ll wilt just the same. The vinegar breaks down naturally into small molecules that won’t harm anyone or their children, even if they get into it! Spray the baby bittercress plants with vinegar to kill them before they set seed. Do this for a couple of years and I’d bet that you’d be satisfied with the results. It’s cheaper, much more environmentally friendly and it doesn’t take any more time than spraying a nasty chemical. Good luck and let us know what you try! This weed is overwhelming my asparagus patches. It has a deep (for its size) tap root, so dig it out early when soil is wet/very moist. I cannot dig it much when among asparagus since asparagus has such shallow roots as well as massive deeper roots. I don’t wish to spray anything on it. So, I’m next (March 23/24, 2016) going to take hedge clippers and cut off the flowers as best I can to prevent more seeds, and continue to dig out where I can. I’m basing the flower-cutting upon the way a recent drug (Harvoni) “kills” the Hepatitis C virus. Antibiotics don’t kill viruses. But Harvoni prevents the Hep-C virus from multiplying and in the meantime the already existing viruses just die of “old age.” If the severed-flower plants put out more flowers after having been “beheaded,” then I’ve another problem or at least a continuing one. It’s a “war of attrition” I guess. Oh Thomas! Yes, this little bugger is really getting going now. We have the PA Bittercress blooming in the yard, in the flower beds, in the garden and it’s coming up between cracks in the walkway. I’m not sure if beheading the flowers will do the trick as you’ll still have the roots. What if the plant just becomes bushier and flowers again? You’ll still have the same problem only bigger. Digging up the whole plant should help reduce its numbers for next year. I’ll be hoeing them from the garden and from around other planted areas ASAP. It really does pay to start controlling weeds as early in the growing season as possible. I’ve resigned myself to the fact that we’ll always have the bittercress making an appearance in the earliest days of Spring. This year my first photo was on 17 March 2016 and you’ll see it’s been flowering for a while! I agree that most chemicals are too nasty to spray around food plants, but you might give a dilute vinegar spray a chance. It won’t leave any bad residues. If you try it let us know how it works out! You’re excellent description of the bittercress led my Google search to your site right away. I’m so glad I found you and your site! This evening, while walking across my yard to go fill the bird feeders, I was fascinated to see the forcible seed ejection of this plant – in the light of the setting sun it was a quite spectacular display. I live in a heavily forested (deciduous) area in southeastern PA. Having moved here just a few years ago, I’m still delighting in learning the identities of the plants I share my home with. There is one, a low growing plant, that the Pa. Dutch locals call “pigs ear”. By midsummer it covers the little strip of yard I have on the damp, north, and relatively well shaded, side of my house. I can’t say that I find it a particularly attractive plant. Unfortunately, both my taxonomic identification skills, along with my Peterson’s guide, have failed me on this one. Other than this colloquial name, I have nothing else to go on. When they start to appear I could take a photograph – is it possible to upload / cut and paste it in this comment section and, if so, would you mind helping with the identification of the plant? I appreciate your knowledge and passion regarding the use of manufactured chemicals as well. Thank you! Too funny, just yesterday I bent over to inspect some small lettuce plants that volunteered in an area where I usually put some annual flowers and as I did my foot bumped a bittercress and the seeds popped out spraying me in the face! I was surprised and then relieved to realize what had just happened. No wonder these little plants grow EVERYWHERE in the yard. Forcibly ejected is exactly right. You could email me a photo and I’d certainly try to help you identify your plant: wilde AT wildeherb.com. We’re not too far apart geographically, and it seems in curiosity about our natural spaces, so I am curious what ‘pigs ear’ might be. Look forward to it! Would you recommend composting this plant if pulled early before it seeds? Sure, you can try to compost it. I’m pretty sure you’ll never get rid of it completely though. When it’s pulled up you’ll see the many tiny roots spread in all directions and I can never seem to get the whole plant. I wonder if those root fragment left behind will spawn another plant by next year’s spring. I’d say loosen the soil around the plant before pulling it out so you can get the most roots possible. Can’t hurt to try the compost thing, so good luck!